3 March 1911: Entered Army service in the 3. Garde-Regiment zu Fuß after passing out from the Prussian Cadet Corps. 1 June 1910-28 February 1911: Detached to War School Danzig. 2 August 1914: Battalion Adjutant with the 2nd Guard Reserve Regiment in the field. 28 November 1914: Regimental Adjutant of the 2nd Guard Reserve Regiment. 2 August 1916: Wounded/in hospital. 2 October 1916: Returned to the 2nd Guard Reserve Regiment in the field. 23 October 1916: Company Leader in the Recruit Depot of the 2nd Guard Reserve Division. 18 January 1917: Deputy Leader of the III. Battalion of the 2nd Guard Reserve Regiment. 6 February 1917: Adjutant of the 2nd Guard Reserve Infantry Brigade. 20 October 1917: Detached to the 9th Battery of the 1st Guard Foot Artillery Regiment. 10 November 1917: Detached to the 6th Battery of Fußartillerie-Regiment von Linger (Ostpreußisches) Nr. 1. 1 December 1917: Company Leader in the 1st Guard Reserve Regiment. 11 January 1918: Deputy Leader of the II. Battalion of the 1st Guard Reserve Regiment. 1 February 1918: Adjutant of the 1st Guard Reserve Infantry Brigade. 7 May 1918: Adjutant of the General Staff Course Sedan. 5 August 1918: Sick and allocated to the Replacement Battalion of the 3rd Guard Regiment of Foot. 30 September 1918: Transferred to a General Staff position in the 224th Infantry Division. 3 January 1919: Returned to the 3rd Guard Regiment of Foot. 13 January 1919: Leader of the I. Battalion of the 2nd Guard Reserve Regiment. 1 August 1919: Transferred to Reichswehr Infantry Regiment 68. 3 September 1919: Company Leader in Reichswehr Infantry Regiment 68. 30 November 1919: Company Leader in Reichswehr Infantry Regiment 115. 1 October 1920: Chief of the 15th Company of Infantry Regiment 6. 1 October 1921: Detached to Leader Assistant training with the staff of the 2nd Division. 1 October 1922: Chief of the 15th Company of Infantry Regiment 6. 1 June 1924: Captain on Staff of Infantry Regiment 6. 1 October 1924: Regimental Adjutant of Infantry Regiment 6. 1 May 1927: Chief of the 6th Company of Infantry Regiment 9. 1 April 1931: Major on Staff of the II. Battalion of Infantry Regiment 9. 1 October 1932: Adjutant of Infantry Leader III. 1 October 1933: Transferred to Military District Command Potsdam. 1 April 1934: Commander of the I. Battalion of Infantry Regiment 16. 15 October 1935: Commander of the I. Battalion of Infantry Regiment 65. 6 October 1936: Commander of Infantry Regiment 116 of the 9th Infantry Division [took part in the invasion of France in May-June 1940]. 15 February 1941: Commander of the 71st Infantry Division. 28 March 1941-15 December 1941: Commander of the 18th Infantry Division (Motorized) [engaged in Russia from 22 June 1941]. 22 February 1942: Führer Reserve in the Army High Command and, at the same time, delegated with the post of General of Infantry in the Army High Command. 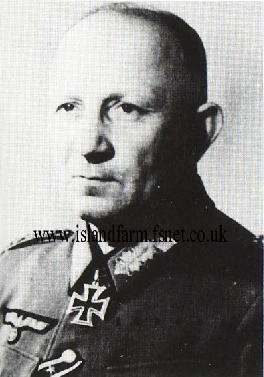 15 October 1942: General of Infantry in the Army High Command. 15 May 1943-25 May 1943: At the same time, delegated with the leadership of the XXVIII Army Corps on the Eastern Front. 5 October 1943: Detached to the General Command of LV Army Corps on the Eastern Front. 12 October 1943: Delegated with the leadership of the LV Army Corps on the Eastern Front. 1 February 1944: Commanding General of the LV Army Corps on the Eastern Front (from January 1944-May 1944, corps command delegated to Generalleutnant Horst Großmann). 6 February 1945: Führer Reserve in the Army High Command. March 1945-18 April 1945: General for Special Employment in Army Group South on the Eastern Front. 18 April 1945-17 May 1948: Prisoner of war in British captivity. Knight’s Cross of the Iron Cross: 22 September 1941, Generalleutnant, Commander of the 18th Infantry Division (Motorized) in Russia. Prussian Royal Hohenzollern House Order, Knight’s Cross with Swords: 26 February 1917.